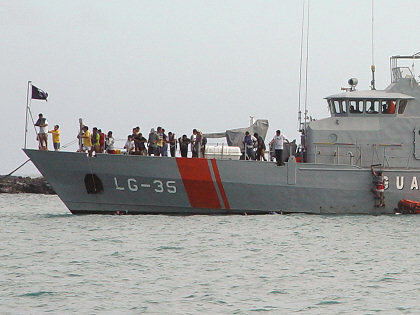 The Ecuadorian Coast Guard ship. The local trainees one-by-one jumping off the bow, swimming alongside, then climbing out amidships using a rope ladder. 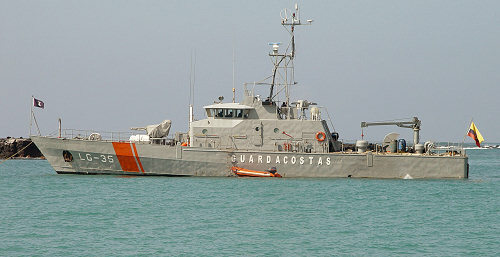 Dawn's early light proved the mystery ship to be a Guarda Costas cutter (that is, from the Ecuadorian Coast Guard). During the morning, we heard a bosun's pipe a-twittering several times as they went through their morning routine. Later in the day, recruits or trainees came out from shore in pangas and did some exercises. For one exercise they lined up on the foredeck and one-by-one jumped off the bow into the water. Then they swam alongside to a rope ladder amidships and climbed back on board. Later pangas took them back to shore. We're planning to leave tomorrow and would like to head for Isla Floreana, so we need to check-out of Isla Isabela today. In the morning we dinghied ashore to the Port Captain, but we didn't need to do any more paperwork—it had all been completed when we checked-in. Marcie asked if we would be permitted to visit Isla Floreana, and the Port Captain said, sure, no problem. He gave us a small slip of paper that was an official permission slip, and even called the Floreana Port Captain to tell them we would be coming. This was very helpful and courteous service. After the Port Captain, we walked around to a few shops to do last-minute provisioning for fresh vegetables, bread, and meat. We also went to do last-minute email and I was going to try another phone call to Mom, but the phone room was very busy and I didn't feel like waiting in line. To tell the truth, I was very tired and a little cranky after not sleeping well last night due to severe rolling. (There was no wind last night, so the boat wound up broadside to the swells.) I was definitely not in the proper mood to handle language problems and phone system problems and (possibly) talk to Mom for the first time in over a month. The last stop was to pick up our laundry at the hotel; they hadn't quite finished so we had to wait. Back at the dinghy, we packed the clean laundry in plastic bags that Marcie had brought from the boat, and it was a good thing. On the dinghy ride back to the boat, a wave broke right on the bow of the dinghy and Marcie and I got soaked. The dinghy took on some water that was sloshing around, but the plastic bags pretty much protected the laundry. My backpack got soaked but my camera was fine in its ziplock bag. We goofed off for a while and took naps, then late in the afternoon, Marcie and David went back to town to buy cheese. When we had visited the store in the morning they told us that cheese would only be available after 4:00 p.m. Marcie was hoping that Richar would have the provisions we ordered, but he hadn't called (he uses a marine VHF radio) so they weren't able to pick up the items. This isn't a problem because we're not leaving until tomorrow afternoon, so there's still time for Richar to call us. According to David's trip-planning, we'll leave in the afternoon, travel all night, then arrive at Isla Floreana during peak daylight the next day. One afternoon at sunset a sailboat upped-anchor and departed, heading for parts unknown. 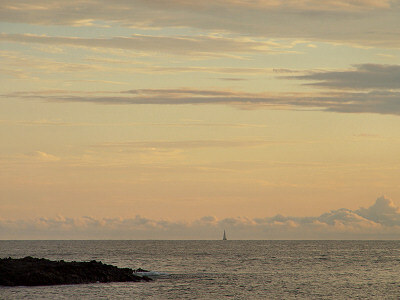 They sailed away from the island as the sunset intensified. 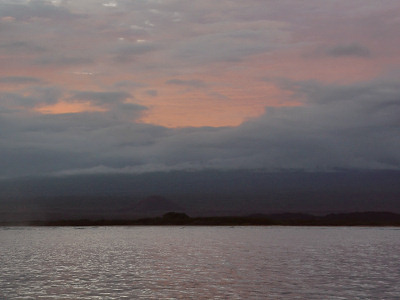 This is the very same sunset, but looking towards the island. As was common, most of the island is shrouded by gray clouds. But a small hole in the clouds has opened allowing some of the sunset's glow to escape. It almost looks like the volcano is erupting. 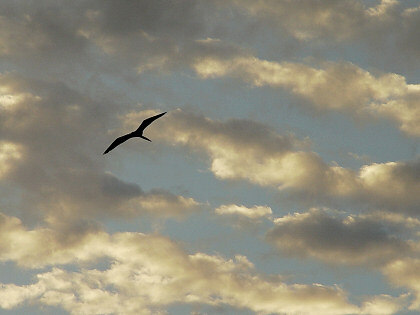 A frigatebird soaring overhead during the same sunset.